Edex Malaysia started to provide Industrial communication products since 1997. Stared off from converters RS 232 to RS 485, Multi-serial ports solutions and fiber to serial solutions. We have currently expand to many others area involving Industrial switches and some other Machine to Machines (M2M) solutions. The proprietary α-Ring technology does not send or need any bandwidth-consuming watchdog packets to check the ring health. The ring port connections are monitored by each attached switch. Therefore, the α-Ring mechanism does not increase network loading. Don’t worry about those already set up STP/RSTP rings within the network. α-Ring does not require you to abandon or to alter already existing STP/RSTP rings. EtherWAN’s α-Ring provides users with the greatest flexibility to communicate with other standard redundant protocols. Industrial networks may be composed of numerous rings and interconnected networks among these individual rings. Network redundancy can be provided via the coupling methods between network rings. Therefore, all the switches do not have to be confined and connected in one big ring. 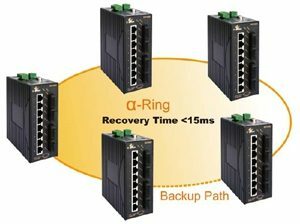 A network containing numerous switches can be broken into smaller, more manageable rings to ensure network efficiency and performance.